Our Shiny New Premises in Leeds, West Yorkshire. — Form Bespoke Jewellers Ltd.
We’ve got a brand new jewellery workshop and showroom in Chapel Allerton, Leeds, West Yorkshire. And we can’t wait for you to come and see it. It’s exciting times here at Form Bespoke Jewellers. With our 15 year anniversary on the horizon, we are ever-growing and developing our unique jewellery experience for you. And with that we have made our move into a bigger premises, just round the corner in Chapel Allerton. Our new creative space now boasts a gallery entrance, comfy waiting room, sparkling showroom, and traditional jewellery workshop. 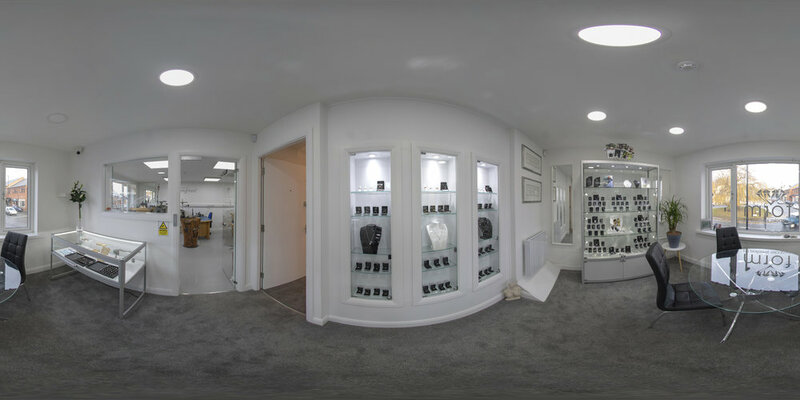 Our sparkling new showroom provides a lovely space for you to come and discuss your unique jewellery designs, directly with one of our jewellers. There is no sales team here at Form Bespoke Jewellers. It will be you and the jeweller, from start to finish. This way, we not only reduce the risk of miscommunication, but we can also really get-to-grips with what you are looking for in your bespoke engagement ring, wedding ring or other jewellery piece. We couldn’t believe that some of our customers didn’t realised that we handmake all your jewellery right here, onsite in our Yorkshire workshop. So now we have ensured that there are windows and a glass door that look directly into our creative working space. You can watch our creative process, see what are jewellers are hand-making and know exactly where your precious, bespoke jewellery is being crafted. We’ve set up a comfy waiting space for you to enjoy before you head into our showroom. It’s important to us that your whole experience here at Form Bespoke Jewellers is special and exciting, right from the moment you walk in the door. Creating a bespoke engagement ring or jewellery gift can sometimes be quite nerve-wracking, but don’t worry we’ve here to help. And you are sure to feel right at home here. Don’t forget to take a look at our gallery entrance on the way in too. You’ll see customer reviews, thank you cards and a beautiful showcase of some of our previous commissions. We couldn’t have done this without the help of a fabulous group of local tradesman, business, friends and family. A special thank you to Maple Homes (Leeds) who did all our renovation work, and Cliffs Hardware (Moortown) who crafted our new workbenches. We hugely appreciate all the time and effort you put into making our new space so great. 3 Stainbeck Corner, Chapel Allerton, Leeds, LS7 3PG.